Here it is almost the 1st of May and we still have a big pile of snow left on our small garden plot. We had planned on getting an early start this spring with our planting but the weather hasn't cooperated. Last year, we had our best garden since I moved here from the Philippines in 2006 so we were really anxious and excited to get a head start this spring. Before last year, I almost decided to give up gardening here in northern Minnesota because the growing season is short and the soil is poor. Where I come from in the Philippines, the soil is really lush, fertile, moist and the growing season is all year round. I am glad I did not give up though, because even though it has been a long learning curve, I am finally getting the hang of it here. We have been experimenting with a lot of different things to try to improve the soil and last year it finally started to pay off. 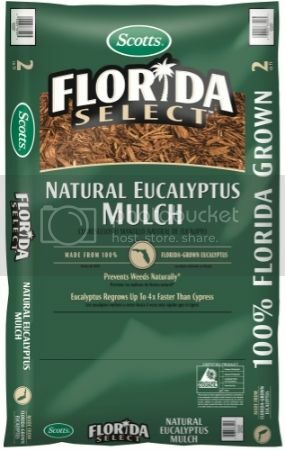 I recently heard about a new product from Scotts called Florida Select Mulch that is made from 100% mulch eucalyptus trees. That is the kind of stuff that our garden really needs because not only will it help fortify the soil, it will keep down the weeds and help the sandy soil retain moisture. We can also use it around our fruit trees, blueberry plants and strawberries. We have already started buying our gardening supplies including seeds, fertilizer and mulch so we are ready to go once the weather begins to cooperate. Hopefully, as we continue to fortify the soil, we will be able to create a sustainable gardening plot for many years to come. The Scotts Florida Select Natural Eucalyptus Mulch is a sustainable Cypress alternative, grown in Florida, for Florida! If you don’t live in the Florida area, Scotts Nature Scapes mulch is an option for your lanscaping needs this Spring! It comes in 3 different colors: Classic Black, Sierra Red and Deep Forest Brown and they are natural forest products – no waste wood and come in a variety of textures. Scotts Mulch helps to maintain moisture, prevent weeds and create a groomed landscape all year long. We live in Florida, I will have to check this stuff out! I have heard that Minnesota really has gotten hit with snow the last couple of weeks. Makes for a short spring. Your yard looks beautiful. Yes Pam until now we still have snow on the ground. That is not my yard, that is the yard that I want to have :-).